Enter To Win a Month of Free Yoga Classes. Win a Month of FREE Yoga Classes! If you are looking for a fun, unique place for a Girl’s Night Out or work/team building event, Debbie’s studio can be used for private yoga classes with one of her amazing instructors. Contact Debbie directly for more information. Have a look at all of our exciting upcoming events. The Baptiste Yoga™ practice, Journey Into Power, supports you to raise your vitality and physical power, and will empower you to create accelerated results in your overall body strength and confidence. This is a powerful Vinyasa yoga practice that includes both standing and floor postures that will build strength, flexibility and balance. Explore advanced pose variations, and connect with your breath, body and mind while transforming your body through this dynamic yoga practice. Yoga experience is recommended. MaryBeth a certified yoga teacher with the RYT 200 designation by Yoga Alliance. Her yoga students receive more than a physical workout; they receive connection and inspiration to guide them along their journey of physical, emotional, and spiritual transformation, both ON and OFF their mat. She is committed to inspiring and empowering her students while helping them focus on their breath and presence, making them stronger, more flexible, and overall, a better version of themselves. MaryBeth believes in awareness, self-inquiry and continual learning and unlearning. She continues to invest in herself with additional training, and has completed Level One Journey Into Power, Level Two The Sannyasin’s Journey, and the Art of Assisting Program all through the Baptiste Institute. MaryBeth values connection. She is authentic, convivial, and has an attitude of gratitude. When not teaching or involved in her own yoga practice, she enjoys traveling, writing, reading, and creating. She makes handmade bracelets and malas and sells them on Etsy. She loves sunshine, sunsets, being near, on or in the water, wine, and all things Italian. Price: $15 Drop-In or use your current class pass with DRF. Join us for a special Halloween version of our popular Little Yogi’s class! This class is perfect for kiddos between the ages of 6 and 10. All kiddos can dress up in a Halloween costume that still allows them to move, and they will leave with a goodie bag. Please make sure to sign up to reserve your child’s spot and so we can have a proper headcount. Your children will learn and practice the fundamentals of mindfulness in body, mind, breath and life; in ways that will make sense to them. This class is full of fun, energizing movements and music that will keep them wanting to come back. They will practice ways to center their mind; feel their breath; work with others and find and trust their individuality. Parents are welcome to join but please know this class is developed for children. Age range 6-10 but open to younger or older contingent on individual child maturity level. Call the studio to discuss. The class instructor works with students daily (k-5th grade) in the physical education environment for olentangy schools and can’t wait to work with your kiddos! Kathy dabbled with yoga for many years but didn’t get serious until her marathon coach forced her to include it in her weekly recovery practice. Kathy fell in love with the physical practice first but it did not take long until she was deeply changed by the mental and spiritual practice of yoga. Kathy feels the need to participate in many physical activities to keep her body and mind balanced. Kathy is dedicated to expanding her yoga education to better her practice for her yoga students and herself anyway she can. She is currently 200-hour RYT from Balanced Yoga, 200-hour RYT from Shaktirasa Yoga and currently working on 300-hour Ayurveda lifestyle coach certification program with Shaktirasa. Kathy’s day job is working as an elementary physical education teacher in Olentangy schools. She is excited to bring yoga to Lewis Center. Introducing the Health Pyramid Project!!! This is a 6 month commitment done VIRTUALLY through a private Facebook page hosted by Debbie Reichert that will run from November through April. During this 6 month period, we will focus on three areas of wellness. We’ll be diving into the PHYSICAL self (exercise/nutrition), your MENTAL self (self care, how you speak to yourself and others, and goal setting), and lastly, your SOCIAL self (how you treat and build your relationships with those around you, and the importance of focusing on positive relationships). Debbie is a certified fitness trainer with additional certifications in nutrition, and extensive continuing education in the areas of Life Coaching and the Mind-Body connection. During this 6-month period Debbie will hold you accountable on your exercise program. Too often, people freak out come April/May because they want to be “summer body ready.” Unfortunately by then it’s too late to get the results you want come June. By starting NOW, you will alleviate all of that stress, and finally have those results! You will look and feel better than ever come summer and be fit, healthy and ready for those tank top and swimsuit months! The goal from a fitness standpoint will be to do a variety of exercise. We will focus on strength training, cardio and stretching, split up between 4-5 times a week. If you are not local and cannot work out with Debbie personally in one of her small group training sessions, then you will be responsible for creating and sticking to your own workout regimen. Debbie can provide help on this to get you on the right workout structure and programming. Debbie will be supplying workouts on the page a few times every month that can be done at home or at the gym as well. NUTRITION IS KEY! Debbie will be supplying everyone a copy of her Clean Eating Cookbook. This is included in the cost of the program as an added benefit to committing to this project! Healthy recipes will also be posted every weekend to the page to give everyone new ideas for family friendly eats. Debbie will be supplying information on clean eating, macro-nutrients, foods for fat loss, 20 super foods, intermittent fasting, and proper supplementation just to name a few. We will examine your social self. Are you letting go of the things that no longer serve you? Are you evaluating your friendships and how YOU treat others? Are you being the best version of YOU that you can be?? What is keeping you from reaching your goals?? These are just a few of the questions we will ask and dive in to answer, as well as give guidance to overcome any social obstacles you may have in your path. Every month, Debbie will be bringing in Facebook Live videos done by both she, and resident experts in the fields of fitness, health and wellness, and entrepreneurs who will both encourage and motivate you to take YOUR fitness and business/work goals to the next level. You will be inspired on the page daily through readings, motivating stories and will love the accountability you will have through Debbie’s coaching! If you are READY for CHANGE! Then this Health Pyramid Project is for you! Don’t wait for the future. The future is NOW! We look forward to serving you. 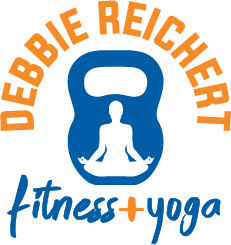 Debbie is a certified fitness trainer, holding additional certifications in nutrition for sports and exercise with hours of continuing education in Life Coaching and the Mind-Body Connection. But certifications and studies aside….the thing that makes Debbie different in the industry is her deep passion for helping to make a positive change in people’s lives. After doing the corporate America route, in 2012, she started her personal training business. This escalated to a small group fitness business and in 2018, after renting space from gyms that didn’t reflect her brand properly, she opened her own studio. At that time, she employed 2 additional trainers and 9 yoga teachers to provide even more services to her client base. There is a sense of COMMUNITY at Debbie’s studio that is not comparable to anything else in the area. Debbie and her staff cannot wait to meet you and hope to see you at the studio soon for some small group strength training or yoga sessions soon! In the Happiness Hypothesis, meditation is offered as a consideration to change your affect (defined as “…the felt or experienced part of emotion.”). It is a very powerful and effective tool that is available to everyone. How to do it, however, is the problem that most of us face. In this Introduction to Meditation Workshop, you will be exposed to several different types of meditation, given a clear explanation of each, and offered the opportunity to practice in a supportive environment. You will leave with tools to start your own meditation practice to lead you on your path of quieting your mind. Tiffany is a registered (RYT-200) instructor through Yoga Alliance. Her 200 hour level training was completed at Yoga West in Houston, Texas. It has been an honor to enhance her education by training with talented instructors such as Robert Boustany, Ricky Tran, Rodney Yee, Colleen Saidman Yee and Jason Crandell. The classes Tiffany teaches include Restorative, Gentle, Hatha and Vinyasa. As yoga continually reveals different parts of itself through her own practice, Tiffany’s interests have expanded to include pranayama and meditation study. She believes these practices have invaluable benefits on the nervous system, and on the body as a whole. Yoga has had a profound effect on Tiffany’s overall health, strength and self-confidence. It is her passion to share this practice with others. It is also her hope that each student has a positive experience, learns through a safe practice and leaves her class feeling better than when they walked in. The extremely talented, Charles Gibson, will lead you through the partner workshop, during which you will learn the history and intention of Thai yoga massage. Massage will help increase flexibility, relieve stress and give a greater awareness of body and mind. Techniques used will work everything from the top of the head to the bottom of the feet. Our hands, elbows, feet and knees will be used to connect with our partners with Metta love and kindness. At the end you will learn enough to be able to work on your partner for a twenty minute massage. Partners can be a friend, spouse, workout buddy, or anyone you want to connect with through this dynamic form of bodywork. Having a partner lead you through this session allows the body to relax and allows the building of trust with the receiver feeling supported by the giver. Picture yoga being done to you, all the benefits without the effort. Some of the many benefits are: relief of stress and muscle tension,improved range of motion, joint mobility,increased energy, injury prevention and mental clarity. No prior experience is necessary. It does not matter if you are not flexible. You will be on the floor so bring mats and blankets to be comfortable on the ground. Join MaryBeth for this very special class!! This class is for students that want more instruction & more class time working on challenging poses without the additional time & cost of a workshop. In this class, we will warm up with some stretching & opening poses & Sun A Salutations. We will spend 30 minutes, workshop style, on challenging poses like crow, side crow, peacock, fallen angel, headstand & handstand. The last 15 minutes of class will consist of the typical poses for stretching & opening, restorative supine poses & savasana. Before take off we will explore the fundamental mechanics of arm balances. Step by step we will prepare to balance on our hands, building a strong foundation in our shoulders, arms and core and discover new spaces in our hips. Any fear of flying will be dissolved when you are packed with strength, flexibly, courage and confidence! Join us and have fun exploring as you lift, float, leverage and maybe even fly! For new and frequent flyers! Brooke experienced her first yoga class 18 years ago. She first enjoyed the physical benefits but later noticed the benefits of a yoga practice go beyond the poses. The shapes she creates on her mat remind her to breathe, to feel, to have an open heart and open mind, to go with the flow and trust the process on and off of her mat. These experiences inspired her to complete her yoga teacher training so she could share these gifts of yoga with others. Since 2010 Brooke has guiding others in their yoga practice and enjoys witnessing the amazing shifts in their flexibly and strength within the body and the mind. Brooke is a 200hr E-RYT and loves creating yoga classes that are fun and challenging for all! Join Alyssa in the studio and celebrate the Winter Solstice with this traditional practice of up to 108 sun salutations. Take a moment to get away from pre-Christmas rush. Cleanse and energize the body & mind and set new intentions in preparation for the new year ahead. This is an ancient practice used all over the world to celebrate the change of seasons. Enjoy practicing with other people and the feeling of working together on the mats. Allow this practice to uplift you, and see how the rhythm of your breath and your body take you through this moving meditative practice. Whether you complete 1 or 108 sun salutations it really doesn’t matter. Alternative options will be explained at the beginning allowing you to focus more on your breath if you need a break at any time. Following the sun salutations there will be some short meditation and relaxation to finish. Please note, the finish time may be sooner than allocated. Alyssa has been practicing yoga for nearly a decade, and finds her passion for it only increasing. She’s explored many different styles of yoga and loves to incorporate everything from kundalini yoga, ashtanga yoga, and mantra yoga into her vinyasa classes. She’s also studied Ayurveda and tries to structure classes to be the most beneficial for the season of the year. She hopes that all her students find peace and direction from within after attending her classes. Alyssa completed her 200 hour teacher training through Yoga Flow in Pittsburgh, PA in 2015. She hopes to get certification in kundalini and ashtanga yoga in the future. Jump start your yoga practice with attending our beginners yoga workshop with MaryBeth Tipton. in this workshop, MaryBeth will go over the importance of breath in your yoga practice, true north alignment, basic postures, flow, and modifications for poses. this workshop will also be a perfect opportunity to ask questions and discuss modifications.if you know someone that has been wanting to try yoga, this is a great introduction for them, so please share and bring them along! This workshop is perfect for you! The basics of a yoga class, fundamental poses and safe and proper alignment will be explored. Personalized modifications as needed will be offered. The casual approach to these topics will allow for plenty of questions and hands on assistance to assure you will feel comfortable and confident in your poses and any yoga class you may attend. Come see what it’s all about! Did you know that the conscious consumption of chocolate can help bring you into the present moment, much like yoga? In this special class you will experience the decadent harmony of Yoga + Chocolate! Pairing two of the best things in the world, delight in an immersive blend of sensation, movement and flavor. All levels welcome. Personal chocolate included with class, consisting of a home made hot cocoa, and a variety of specialty chocolates. Join us for a special 3-week yoga workshop series perfect for new or experienced yogis alike! Classes will run 3 Sundays in Feb for 1 3/4 hours to enhance your practice. Details of each workshop are listed below. The cost for ALL THREE workshops is a discounted price of $60 total. While we recommend doing all 3 in this series, you may purchase single workshops as well for a $25 investment each. Must be purchased through MindBody online (NOT through the app). Looking to discover a new light in your sun salutations? Learn safe and proper alignment as we break down each pose used in sun salutations A and B, explore variations for each sequence and practice rhythmic breathing. Expand awareness, awaken energy and build a strong flowing sequence. It is one of the most commonly repeated poses in your practice. As we deconstruct chaturanga you will gain knowledge and awareness of the anatomy and alignment of what will soon be one of your favorite poses! Take the sense of struggle out of the pose with corrections, modification and options to safely move in, hold, and move out of chaturanga with strength, ease and grace. What do your gaze, pelvis, core, feet and mind have in common? Join us and discover how they can all work together to keep you grounded with a balance of ease and strength. You will learn techniques for bringing stability to your standing balance poses and variations to take your pose into new spaces. Warning: your improved ability to focus may spill off of your mat into your work, relationships and life moments! Instead of listening to music, you become the music in this exhilarating full-body workout that combines cardio, conditioning, and strength training with yoga and pilates-inspired movements. Using Ripstix®, lightly weighted drumsticks engineered specifically for exercising, POUND transforms drumming into an incredibly effective way of working out. $15 for class. If you currently have a class pass with DRF, then you can use one of your passes for this class! Price: $15 or use your current class pass with DRF. Come flow with us while being your most authentic self. Laugh, sweat, shine and balance to some of the most popular karaoke songs around. Sing your heart out as you open yourself up to endless possibilities. In this class, everyone is a Rockstar. Karaoke yoga is an all levels flow class – great for beginner and seasoned yogis alike. Stay for a complimentary glass of wine after class! AND…..YES there will be disco lights! Let go of those inhibitions and join us for a night of fun. Join us for a fun pop up Vinyasa Flow class with Kathy. The playlist will be 90’s and the practice will be a workout! Come ready to sweat, challenge yourself, have fun and connect with others through good music and a great community. You can use your current class pass with Mindbody or a $15 drop in. Kathy Morgan will take you through guided meditation and movement practice; and will finish the class with a beautifully guided Yoga Nidra for Sleep meditation. Her deeply calming voice penetrates into your very soul, instilling a sense of internal peace and leaving you feeling incredibly relaxed, present and rejuvenated. During a typical class, Kathy will use a variety of techniques—including guided imagery and body scanning—to aid relaxation. And unlike a quick Savasana at the end of asana practice, Yoga Nidra allows enough time for practitioners to physiologically and psychologically sink into it—45 minutes for this class. 45 minutes of Yoga Nidra is comparable to 4 hours of deep sleep. The ancient yoga text the Mandukya Upanishads refers to four different stages of Yoga Nidra. The practitioner begins by quieting the overactive conscious mind, then moves into a meditative state, gradually finding a state of “ultimate harmony,” in which the brain waves slow down and a subtle euphoria emerges. Though most practitioners don’t slip easily into the more advanced stages, they still tend to emerge feeling rejuvenated. Yoga Nidra uniquely unwinds the nervous system, which is the foundation of the body’s well-being. Join us for a special Easter version of our popular Little Yogi’s class! This class is perfect for kiddos between the ages of 6 and 10. Please make sure to sign up to reserve your child’s spot and so we can have a proper headcount.